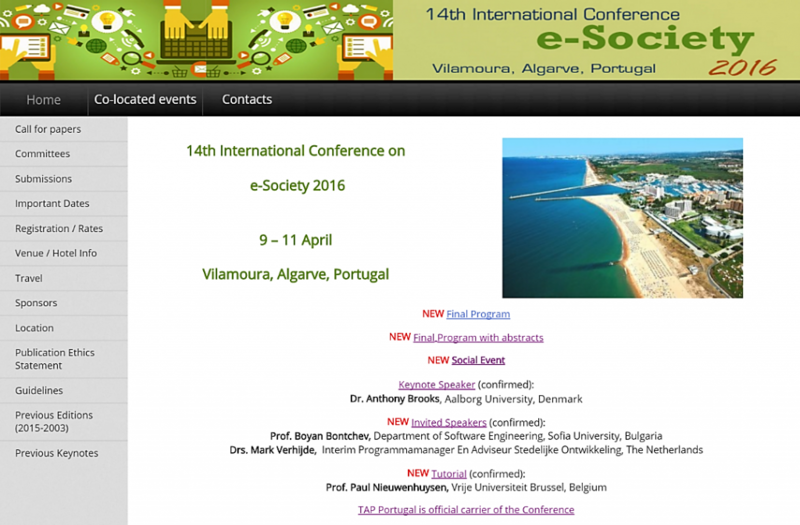 IADIS e-Society 2016 From 9 – 11 April the IADIS 14th International Conference e-Society 2016 will take place in Vilamoura, Algarve, Portugal. A great setting for exchanging views and knowledge about eGovernment, societal Apps and Open Government. I will present the paper The GOV indicator: Learning from Good Practices of the EU Grundtvig LLP project OPENGOVEU 2013-2015 as Invited Speaker, which I consider a great honor. Thanks to Menno Both (Both Social, Enschede) and Piet Kommers (University of Twente, Enschede) for co-working on this topic and for co-authorship. Thanks to Peppino Franco and the great people of the OPENGOVEU project for their enthusiasm and fine contributions. The paper presents the argument that the 62 Good Practices selected by the OPENGOVEU partnership are best analyzed and interpreted using the GOV typology, based on three distinct types of relationships between government and citizens/society. The presentation may be found hier. For more information about the e-Society Conference’s program and abstracts, please click here. If you want to know more about the EU project ‘Open Government in Europe’ (OPENGOVEU) check out the website.